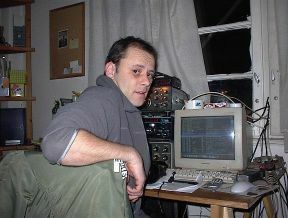 Ivan Artner, HA5TS was one of the founders of the #hearsat IRC channel, and this website, UHF-Satcom.com. 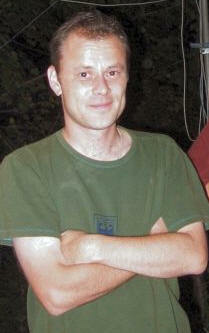 He was extremely active in satellite monitoring, and was always ready to challenge any new findings with his theories. Together with other satellite enthusiasts, NROL-22 which was a NSA recon-satellite was detected, and over a few days, the orbit parameters calculated accurately - this is just one example of literally hundreds of satellites that were identified by a team effort mostly led by Ivan. He also discovered a UHF to S-band transponder on some GPS satellites. Ivan was mostly active on UHF and S-Band, and had established a very sensitive ground station at his new house in Tok, just north of Budapest, Hungary. He was in the middle of compiling his S-band observations - he had decided to catalogue and track anything between 2.2GHz and 2.3GHz, and where possible make orbital determinations - this work is ongoing in Ivan's memory. Ivan made a film a few years back about MIR and space stuff in general; its on YouTube. There is also a video from Ivans rock days, on line here. Ivan was involved in a fatal road accident on the 17th May 2007. He is sincerely missed from the #hearsat IRC by all his friends in the satellite monitoring community. He leaves behind his wife and 3 year old son. The legendary bass guitarist of FLASH band, obsessed HAM, satellites hunter and Space Station researcher, our colleague and friend has died, He was the most valued technical genius at the beginning of the Internet in Hungary and of the public radio-broadcasting, Ivan Artner is the name. He was only forty years old. At the beginning of the 90s Artner’s duty was technical maintenance of “Radio Tilos” which is operates using transmitter equipment that was smuggled from Holland (it was illegal to own any kind of transmitter at the time, and much more illegal to use it), and he knew some kind of technical trick to hide this massive illegal “partisan” transmission from the hyperactive measuring cars owned by PTT. When I visited him the first time, what I saw at first look was many mysterious technical types of equipment from the floor to the ceiling, looks some kind of private cockpit of a space station. One of he’s PC a software has run what is simulates the MIR space station orbital space-way and on the balcony I saw a large satellite dish that looked like a big millstone. The MIR Space station transmitted unscrambled pictures from its cameras to a small group of people on a particular frequency, Ivan’s got more than 40 hrs of video from this transmitter, when MIR crossing over Budapest. He was THE PROFESSIONAL of the telecommunication - his word was the rule. He helped a lot, when Internetto portal, the very first Hungarian Portal, started using multimedia streams, and he was the pioneer of Hungarian Internet television that began to operate like Internetto TV. He installed and operated the very first live WEB cam “EXPO WEB camera” which was placed on a ship at the moorings on river Danube in Budapest. He was able to image different satellites in the sky on summer nights; on his PC he has software which shows all satellite positions. He knew all about satellites, their frequencies and positions, and he spoke to Brazilian fellows via open satellite channels like any others use their own cell phones. During the bombing of Serbia, we heard at his home a lot of live voice chat/discussions between the US bombers and the HQ. The call sign of Ivan Artner HA5TS (hotel-alpha-five-tango-sierra), today sadly we say “Silent Key” according to the strange and unknown terminology of HAMs comes from the MORSE CODE times.